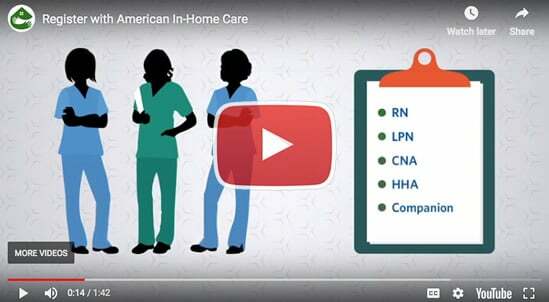 Are you ready to take control of your career as a care provider? We always refer qualified care providers with the special skills, credentials, and personality it takes to act as a caregiver, friend, and confidant. You can take on the role of so much more than a caregiver, helping individuals maintain their independence and dignity, and becoming a cherished part of their life. The care providers we refer offer services that help make living at home easy and safe for our clients. We will match your specific skills with the client's needs that can include Companion Care, Personal Care, Live-In Care, 24-Hour Support, Alzheimer's & Dementia Care, and Skilled Nursing. As an independent contractor, you will have the freedom and flexibility to take control of your career. You can set your market rates, and choose when, where, and how you work. Whether you contract with us primarily, or are picking up additional shifts, you will always have the full support of our team at your back. We are recruiting independent contractor care providers for all of our sister brands, and all of our licensed service areas.